Grinders are extremely under-valued gadgets when it comes to making coffee, when in reality they can define the quality, strength, and aroma of your drink almost as much as the freshness or roast. A grinder is a relatively inexpensive way of upping your coffee game, either by switching to beans to get fresher coffee in your own kitchen or by improving the quality of grind you get at home for your French press or even your espresso. But unless you’re already a coffee aficionado, it’s hard to find the right grinder for your needs and budget. This list of 10 best coffee grinders 2019 will help you narrow down the options and the buying guide below will help you narrow down the type of grinder you really need. Why is grind so important? Coffee grinders come in two make types – burr and blade. Burr grinders provide a more consistent grind and better results, but at a higher price, while blade grinders are often used to grind more than just coffee and are more affordable. If you’re unsure what to look for in a coffee grinder or don’t know why they’re so important, take a look at our Coffee Grinder Buying Guide below. 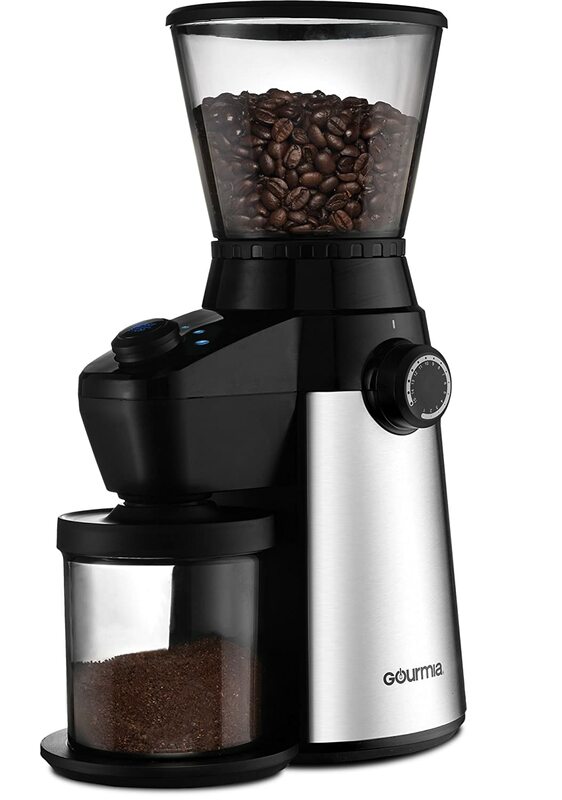 The Gourmia Stainless Steel Grinder has 15 pre-programed settings for everything from cold brewing and French presses through to espressos and Turkish coffees. As the price suggests, it is made with professional grade components to offer consistent, easy grinding every single day. Both the bean hoppers and the grinding head can be removed for easy cleaning and to keep the mechanism dry. The grinder itself is strong enough to give you ultra-find powder for both espressos and Turkish coffees – if you’re a fan of the latter, it’s important to check that your grinder can handle it without overheating or clogging. The price, functionality, and build quality make the Gourmia Electric Coffee Grinder one of the best grinders you can buy. It’s simple, easy to use, and will last for years to come. If you’d like to use your grinder for more than just coffee, having two grinding cups is an excellent way to keep the flavors and aromas completely separate. The Secura Electric Grinder is small but powerful. 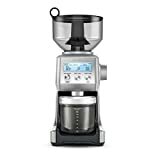 It is excellent for smaller kitchens but may prove to be frustrating for people who grind larger amounts of coffee at ones since the machine only has a small capacity. Spare parts are available, but the smart overheat protection system means that the motor keeps working for longer and you’re less likely to need spare parts any time soon. 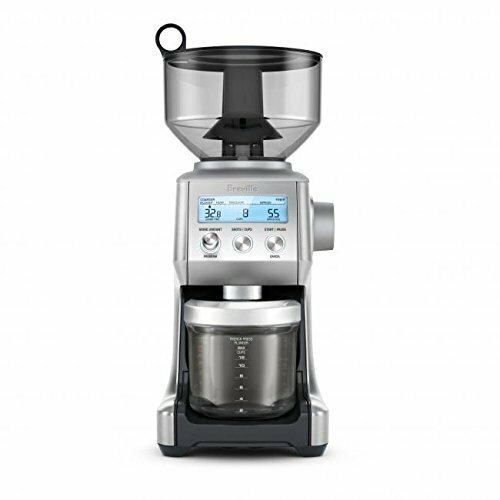 This is an excellent machine for households with a single coffee lover or a small kitchen. The Secura is affordable but does not compromise on quality. 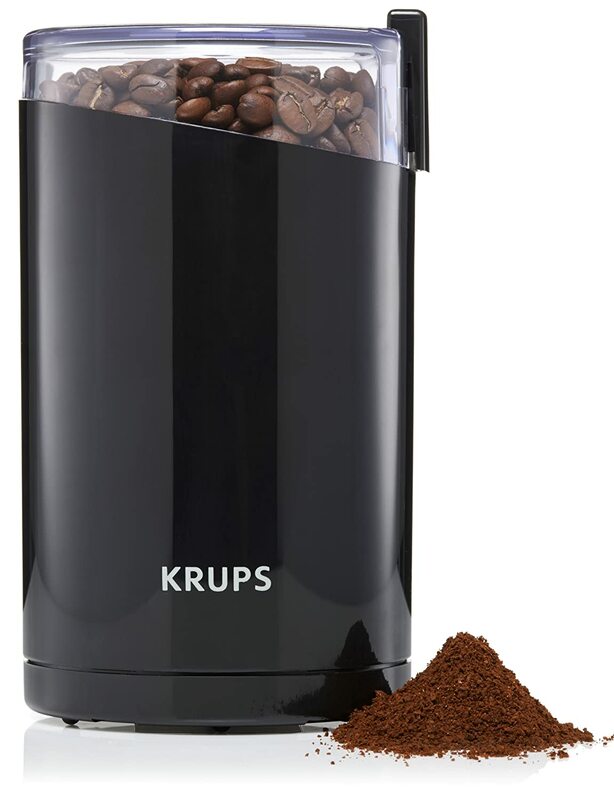 When it comes to budget-friendly grinders, Krups are definitely a brand to look at. The F203 Electric Grinder is made from stainless steel and uses a blade to grind down your coffee to your preferred fineness. There is only a single setting, so you will need to base your grind on time rather than use pre-programed settings. It is affordable, easy to use, but harder to clean than many grinders. Unfortunately, there has been no real thought given to keeping it sanitary and washing after grinds, which may mean that the grinder will not last as long if you’re not careful when getting it wet. It’s an excellent option for inexpensive coffee beans that don’t need a very precise grind – it is affordable and small, so may be a worthwhile investment for beginner baristas and even coffee-loving students. 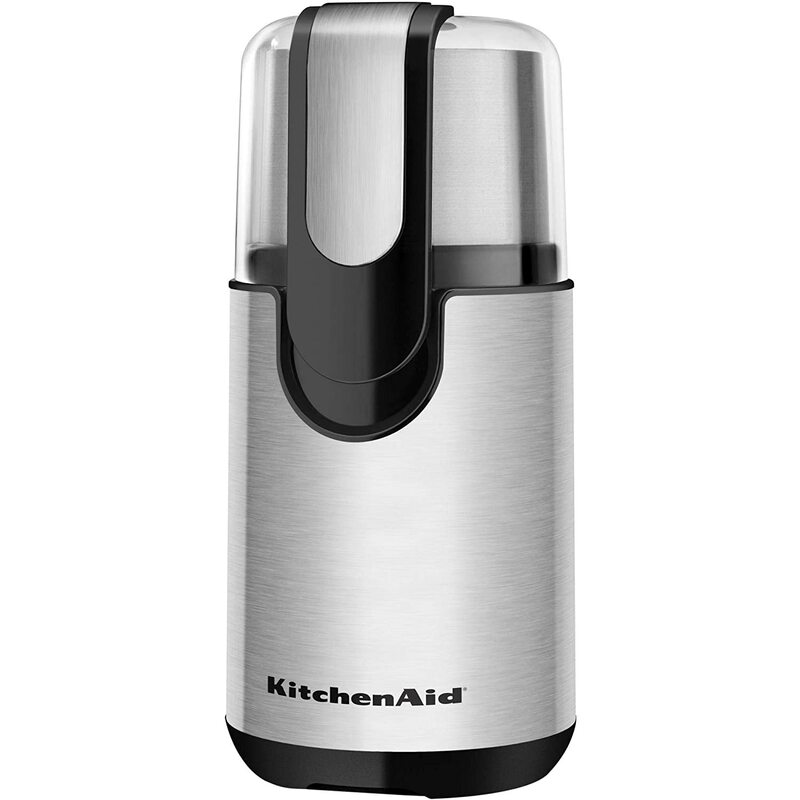 As coffee grinders go, the Kitchenaid Blade Coffee Grinder is actually a little controversial. While it is well-built and well-designed, it’s not quite as quiet as the adverts suggest and some people have experienced inconsistent grinds and even beans getting stuck under the blade. Whenever you’re looking at a product, it’s important to consider the price context. 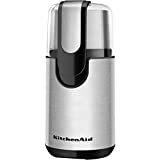 The Kitchenaid is a very affordable grinder, which does mean that it lacks some of the qualities that higher end grinders deliver. 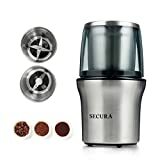 It is very much a multi-functional kitchen gadget rather than just a coffee grinder, which goes some way to explaining some coffee lovers’ dissatisfaction with it – it does come with a few spice grinding accessories as well – if you would like a coffee grinder that can cope with spices such as cumin this is an excellent buy for the money. However, if you would like a dedicated coffee grinder that offers very consistent grinds, this is not the grinder for you. Baratza are one of the few companies who specialize in coffee grinders, offering some of the best burr grinders on the market. Burr grinders are seen as the better option above blade grinders, offering a more consistent grind and quality. The grinder itself is excellent – you can use a timer to get the right grind or the 40 pre-programed settings that cover everything from 250 to 1200 microns so you can get precisely the grind you want. It offers consistent grind quality and can cope with larger amounts of coffee too. It’s a very well-build machine made from quality materials, especially for its price point. The main problems with the grinder relate to everything round the grind; to empty the hopper you need to turn the entire machine upside down. Also, the grind knob is not attached very well so is prone to falling off and rolling across the kitchen. All in all, an excellent grinder that has some unfortunate quirks but they won’t affect your coffee. Not many grinders come with a LCD screen that offers details down to 0.2 seconds, so if you want a coffee grinder that gets rid of the guesswork, the Smart Grinder from Breville is an excellent choice. You can grind directly into a portafilter, grinds container, filter basket or paper filter, depending on your grind and how you intend to brew your coffee. The hopper is great for parties and can take up to a pound in weight. The hopper is also easily removable and there’s a grinds catcher as well to prevent spillages. The design was clearly created to make life easier – most important parts of the grinder are detachable to make cleaning easier while other parts can just be wiped down. 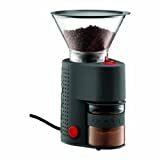 This is an excellent grinder that offers enough options and control to please almost every coffee lover. It’s easy to use, easy to clean, and even comes in 3 different colours to suit your kitchen too. Speed is important, as are friction and heat. That’s why the Capresso Jura Infinity Coffee Grinder was designed to have the slowest grind in its class – this reduces friction and heat build up to preserve your coffee’s aroma and flavor at every grind setting. There are 16 pre-programed settings to choose from, giving you good control over the fineness of your grind. The mechanism works well even with smaller amounts of beans in the hopper and you do not need to worry about beans going stale or being left in the mechanism. However, it is one of the noisier grinders on this list and can be messy when working on coarse grinds. Other than this small drawback, it’s an incredibly consistent and well-built machine. It’s easy to see why it is one of the most popular grinders at this price point. There are two main issues with cheaper burr grinders – clogging (especially with oily beans) and static. The Bodum Bistro Electric Coffee Grinder avoids both of those issues through good design and intelligent material choice. The glass catcher reduces static and plastic spokes on the burr keep beans moving through rather than getting caught or clogging. The grinder is easy to clean and produces a quality, consistent grind even for espressos and Turkish coffees. It’s simple to use with one-button operation, and generally delivers exactly what it promises. One of the major drawbacks of this machine is the heat management – the manufacturers recommend that you stop every 20 seconds to prevent overheating, which can be frustrating if you have a lot of beans to grind at once. The timer also will not work if the grind time is set to less than 5 seconds, so a quick pulse is not an option. All in all, this is an excellent machine. 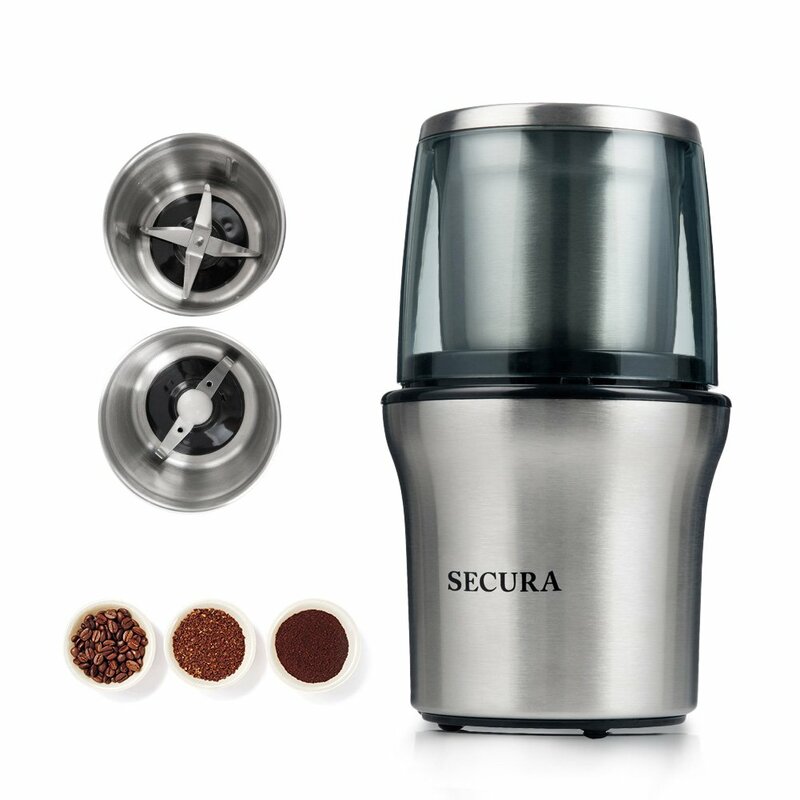 It avoids many of the pitfalls of similar burr grinders and just needs a few breaks to keep your coffee at its best. 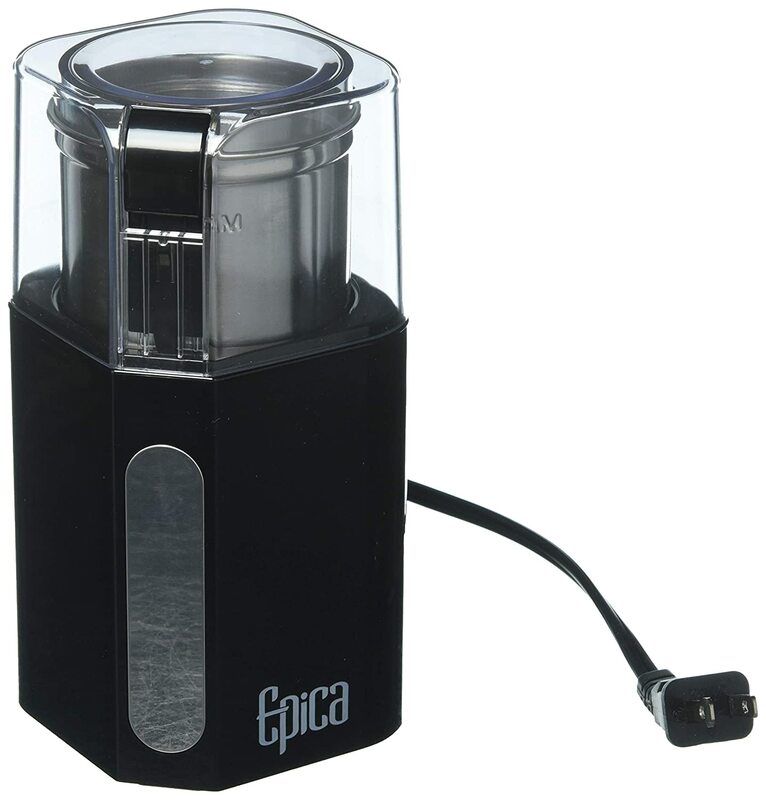 The Epica grinder is a small, simple grinder with a powerful motor. It’s extremely simple, with a single button, clear lid to monitor your grind, and you just have to hold the button until your coffee is ready to use. It’s simple, cheap, and cheerful, but grinds both standard and more oily coffee beans with ease and comes with a 2 year warranty. The button is almost twice the size of other grinders, which means that you don’t need strong hands to work it – a benefit for so many coffee lovers who may struggle with more traditional designs. The cup is removable and you can also remove the blade to make it easier to clean as well. This feature also extends the life of your grinder since there’s no need to get any part of the mechanism wet – you can just clean the cup separately. You can even put it in the dishwasher. If your grinder does break, you can easily order and replace spare parts rather than buying an entire new grinder, which makes it an even better investment. 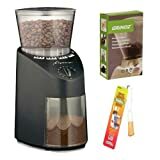 However, there is only a single setting so if you would like pre-programed grinds and more flexibility, you would be better off buying a burr grinder, which costs more but will suit your needs. 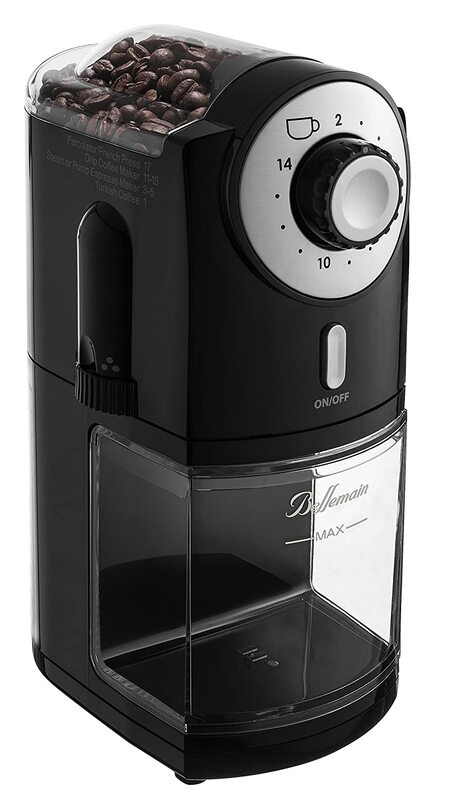 Few coffee grinders manage to be compact and take on a large capacity of coffee beans, but somehow the Bellemain Burr Coffee Grinder does it. The grinder can handle enough beans to make up to 14 cups of coffee without making too much noise or fuss. It even automatically shuts down when the grind is done to avoid overheating or overworking your coffee. It has 17 different settings and can handle fine grinds for both espressos and Turkish coffees. The main problem with this grinder is that it generates a lot of dust, even on coarse settings which means that you might get some sludge in your french press or clog your paper filter, and the overall result is likely to be bitter if you don’t get rid of the powder before using the coffee. Generally, it’s a better grinder for people who want a fine grind rather than people looking to cold brew or use a french press. Overall, it is a quiet machine that will last a long time – the manufacturer’s 2 year warranty shows their own confidence in a good lifespan. If you would like a fine, consistent grind this is a good choice. Freshly ground coffee takes your caffeine addiction up a notch when it comes to taste, aroma, and overall quality. The sooner you brew and drink your coffee after the grind, the better your coffee will taste. Some even believe that the grinder is more important than the coffee machine you use. Grind size defines how much surface area your coffee has, and therefore how long it needs to be brewed to avoid bitterness and to get the maximum flavor. The longer the brew, the more coarse your grind – so espressos need to have a very fine grind since the water is pulled through the coffee very quickly. This all comes down to the contact time, extraction rate, and flow rate. The largest the surface area (finer the grind), the higher the extraction rate. The higher the extraction rate, the less time you need to brew your coffee. If your grind is too coarse, your coffee will be flavorless. If it is too fine (or brewed for too long) it will be bitter. The fantastic coffee smell that you associate with coffee shops comes from the grind – freshly ground coffee is damp and releases oils into the air (and into your coffee when brewed). Just half an hour after coffee has been ground, these oils start to dry up and evaporate, which means that you’ll never get the same flavor out of that grind again. If you are unsure about what constitutes a fine or coarse grind, it may be a good idea to buy a pre-programed grinder so that you can select the option instead of guessing with a single-setting grinder. Most high end grinders have multiple settings so that you can choose exactly the fineness of your grind without having to monitor it or hold down a button while it works. This is generally the preferred approach but timbers and the mechanisms to create programs increase the cost of these grinders. If you are looking for a cheaper grinder, it’s likely it will have a single button that needs to be held down until your grind is complete. Burr grinders are widely acknowledged to be the better quality grinders – they use a number of small milling wheels to grind coffee beans and deliver a much more consistent texture than blade grinders by grinding the beans down. Blade grinders are essentially just small blenders – it shreds the beans, which can mean that it produces an inconsistent texture that can then affect the flavor. However, blade grinders are more versatile (they can be used for spices as well as coffee) and they are considerably cheaper than burr grinders, which is why they are still a popular option.